Private First Class Milburn H. Henke (August 24, 1918 - April 26, 1998) of Hutchinson, Minnesota, assigned to the United States Army's Company B, 1st Battalion, 133rd Infantry Regiment, 34th Infantry Division (the "Red Bulls") descends the gangplank from a British tender that brought him to Belfast's Dufferin Quay from HMTS Strathaird, a passenger liner converted to a troop ship. 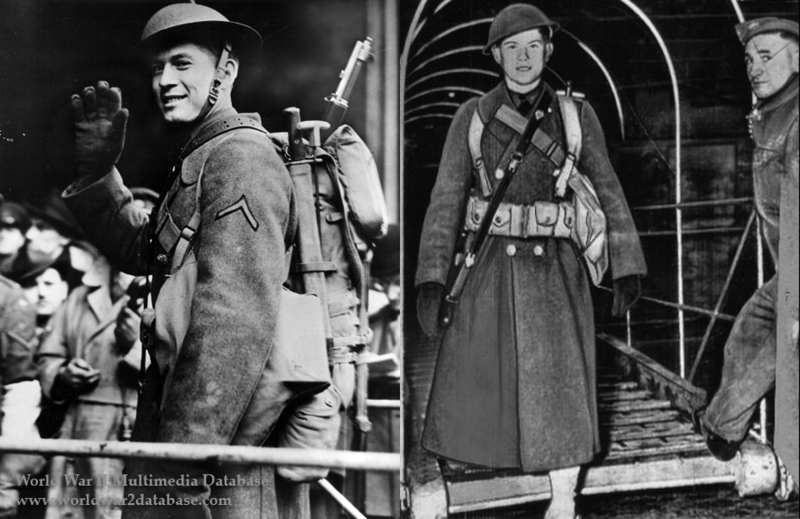 Note his M1918 helmet, M1903 Springfield rifle and jacket and tie. These were the first contingent of the MAGNET Force to defend the United Kingdom and officially the first Americans in Europe. Henke was with his Company when a Colonel asked Henke's Lieutenant for a volunteer. Henke thought he was going for shore duty unloading equipment. Instead, he met Major General Russell P. Hartle, the commander of the 34th Infantry Division. Henke later recalled, "I was sitting on some barracks bags, and this colonel came up the gangplank, and there were about fifteen of us. There was a lieutenant there and he said: 'I want a man from Company B, 133rd,' and Lieutenant Springer, he turned around: 'Henke, you go with him.' When I got by the gangplank, General Hartle came to meet me. He said, 'Do you think you can talk over a radio?' And I said, 'Well, if I have to, I think I can.'" Henke was officially credited with being the first American enlisted man to land in the European Theatre. One of the few men in a National Guard unit mostly composed of Iowans, he stunned his Army handlers when he announced he was from Minnesota. Actually some 500 men had already disembarked from Strathaird and USS Chateau Thierry (AP-31). Their convoy had left Brooklyn on January 15, 1942. Additionally several hundred Americans had flown in or landed in London to prepare for the onslaught of Americans that would peak in 1944. As Henke descended and met with British, Irish and American reporters and spoke on the radio, an American band had to be silenced as they struck up the Star Spangled Banner; they were a unit of 500 men who had formed up on the dock and were marching to their billets. Henke was nationally famous at a time when the United States was retreating on all fronts. His name and photo were national news back in the United States. The press played up the love story between Henke and Iola Christensen, Henke's girlfriend in Minnesota. She also was obliged to give a press conference reported nationally, swearing that she would wait for him. staging a radio call between Henke in Ireland and Christensen and Henke's parents in Minnesota. Henke had enlisted before Pearl Harbor on October 10, 1941. Later in 1942, Henke was turned down for Darby's Rangers, perhaps because of his celebrity. Henke spent nine months in Ireland and England before landing with the 34th Division in North Africa as part of Operation Torch. He received the Silver Star for crawling forward under fire to rescue an officer who had been shot and was bleeding to death; Henke saved his life. While preparing to land in Italy, his back was broken when a weapons carrier rolled over. He spent several months in hospitals in Oran and Algiers before he returned to Minnesota on leave. Christensen agreed to marry him the same day and he spent the rest of the war in the United States, with Iola close by. He returned to Ireland in 1992 for the fiftieth anniversary of his landing. The 34th Division fought in North Africa and Italy for the entire war, the longest serving unit in the United States Army. Very few of the 4,058 men who landed with Henke were left in the unit in 1945; only seven men who landed in Northern Ireland remained in 1st battalion in 1945. Henke felt he didn't deserve the attention, especially when so many died and were never national heroes. He and his wife remained married until his death in 1998.